The fireworks on July 4, 1858, were more spectacular than ever. Crowds gathered in Union (later Spencer) Square for the display were startled to see flames shooting from their brand new high school, burning it to the ground before it could even be occupied. 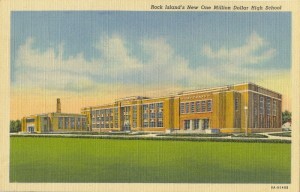 Only two years earlier, five separate school districts had been consolidated to form the Rock Island School District. One of the first acts of the new district was to build that high school on the northwest corner of 7th Avenue and 22nd Street. Old photos show an impressive 3 story brick building with many chimneys. 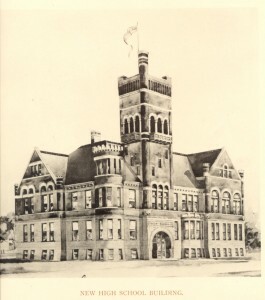 After the fire, construction at the same location began immediately for the second high school, which was ready for occupancy in 1859. 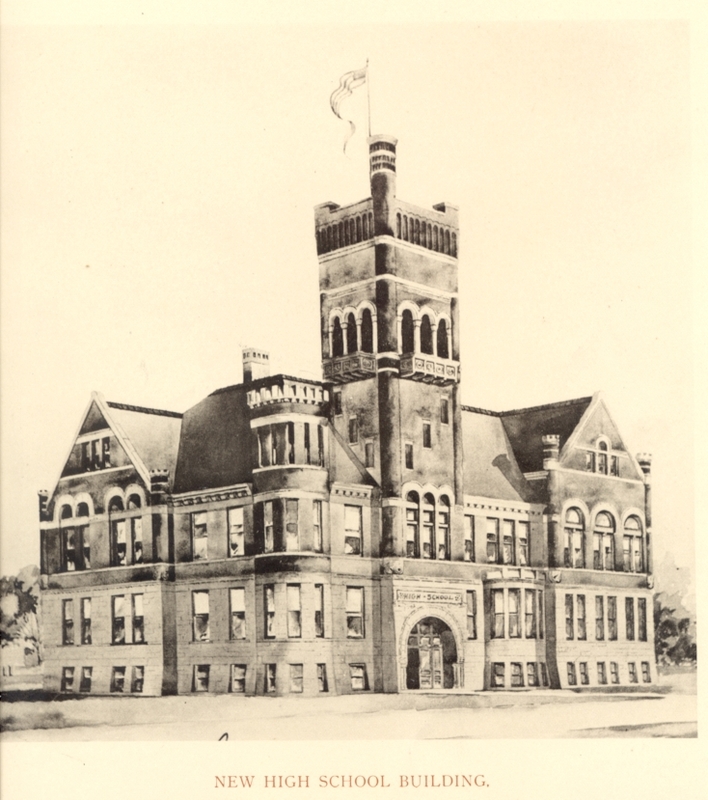 That school was razed in 1892, to make way for the new P. S. No 4 (later “old” Lincoln School). In the meantime, a third high school had been built in 1886 (and enlarged in 1898) on the corner of 6th Avenue and 21st Street in the same block. That high school was probably designed by the architect who later designed Lincoln, Edward S. Hammatt. It looked very similar to Lincoln, with the addition of an impressive round tower at its corner. Once again, fire struck. On February 15, 1901, this school, too, burned to the ground. 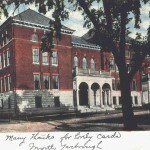 another postcard article, was used until the completion of the present building, shown on this postcard. The building continued as Central Junior High School, until a fire set by two students destroyed it on December 11, 1949, with damage reported at $1 million dollars. The day after that fire, the Argus showed many photos of it and other local school buildings destroyed by flames. In the 1920s, a semi-rural hilltop site on 17th Street was purchased. Plans were made to first build a stadium, whose cornerstone was laid in 1929, and later a larger high school. 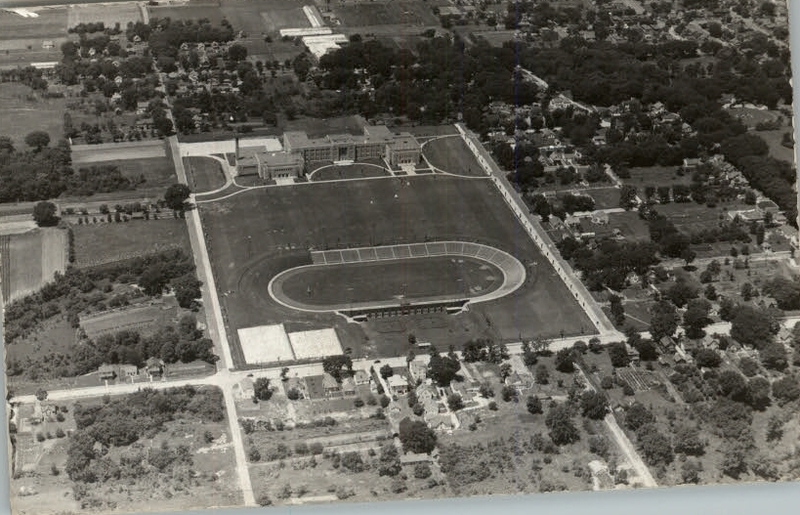 It is appropriate that this postcard, which was published in 1945, shows the stadium in the foreground, since it predated the high school by nearly a decade. The original stadium cost was reportedly $80,000, while the recent major renovation and restoration cost over $750,000. The Great Depression disrupted many plans. 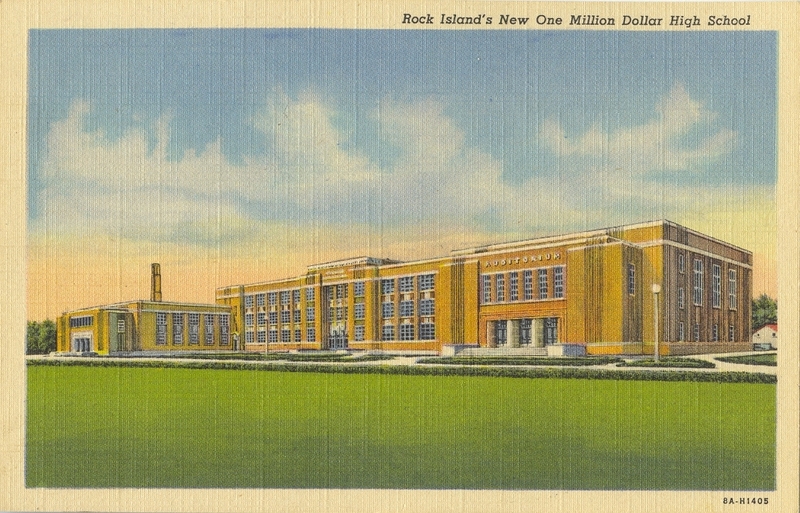 But in the mid 1930s Rock Island was finally able to build its fifth high school, when federal programs became available. The overcrowded old high school had been designed for 600 students; the new high school was designed for 1600 and could accommodate 2000. In an Argus editorial lauding the new school, its cost was reported as $1,250,000, of which nearly $480,000 was provided by the Public Works Administration. That grant meant no increase in local school taxes. (And to put this in a contemporary perspective – in those years, Geifman’s grocery store was advertising prime rib roast for 25 cents a pound, while 24 pounds of Pillsbury flour cost 99 cents. McCabe’s sold women’s new fall dresses for $1.88 – $9.67). Additional land west of the stadium was purchased, and excavation for the high school was begun in 1936. A rapid construction schedule meant the school was ready for use in September of 1937. On Wednesday, October 6, 1937, the first of four dedication ceremonies began with a ceremony for students. The following evening, a dedication was held for the community, producing a nearly filled auditorium. The most formal ceremony was held on Friday evening, and, on Sunday afternoon, the high school choir presented a final vesper program. The aerial view on the featured postcard vividly depicts the symmetry of the campus and how the overall plan integrated the buildings into the landscape. The stadium is in the foreground. 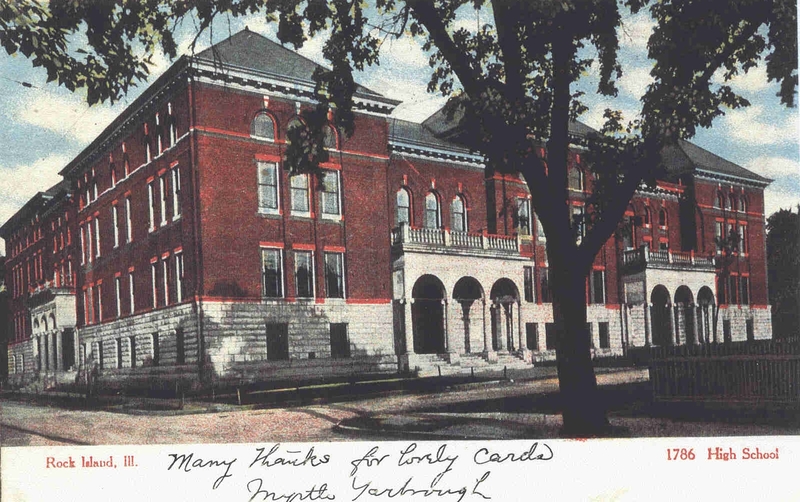 Another ground level view postcard shows details of the front or east facade. The main entrance of the school is at the center of the east face, framed by the twin auditorium–gymnasium wings. Even the circular drives on either end are symmetrical. Originally this symmetry extended to the west face of the school, although later additions have been made here. The large lawns surrounding the school and the stadium provided a unique campus, unparalleled in most cities. Over the years, as the school populations and needs have changed. In 1958, a major addition added a new fieldhouse, swimming pool and classrooms on the south side. Later additions added to the north. Fortunately, the architects and the school boards have chosen to maintain the symmetry of the front of the building as well as its Art Deco styling. A more recent major renovation and updating restored many architectural features of the building and added a new “main” entrance at the south. But it’s worth walking around the building, just to see the beautiful aluminum framed original entrance, with its newly restored lanterns, on the east. Peek through the window of the “Little Theatre” on the north and see the wonderful “streamlined” ticket office, also newly restored. Historic “Rocky” is well prepared for the next millenium. This article by Diane Oestreich is slightly modified from the original, which appeared in the Rock Island Argus and Moline Dispatch on May 20, 2001.